← Men and Pedicures: Macho duck – or “metro-sexual” from a Muslim land? 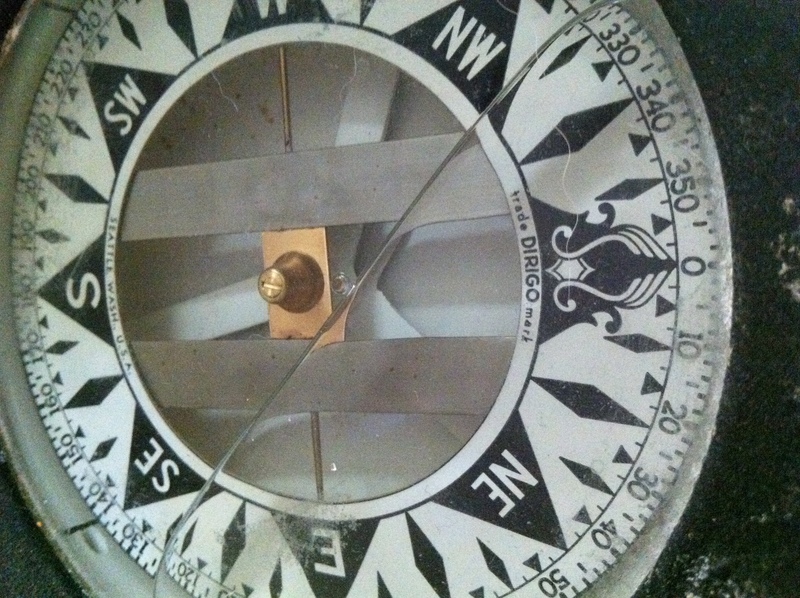 The puppets, and M., encourage me to go more east than west in the way I live my life...this old ship's compass sits on our coffee table,reminding us of the presence of different approaches that exist in our lives...today, the puppets are all over the compass rose in this regard! When I last left you, I was basking the glow of a purple, lavender-scented foot massage and paraffin bath. OK, at least my feet were basking in that glow. I awoke this morning to the horrific beat of my heart and the anxiety of knowing that I am desperately behind on work. Even with all the “no” answers I am giving now that I have the security of tenure almost gained (one more hoop to jump through, the Board of Trustees needs to rubber-stamp my letter), the work is just piling up higher and higher. Not enough hours in the day, etc. I often lament M.’s ability to clear his mind, take time and space for himself, and just generally take it easy. “Eastern approach, canım, is a saner way of life. Join me in it?” he says, smiling on some days, his hand outstretched. I am rarely able to let myself do so, I am sad to say. Today, I bypassed the Turkish tea offered by the chorus of dancing ladies – sweeping aside the bed covers and making a mad dash for the kitchen. Instead of taking their kind morning offer, I went straight for the red bull Nepali-style super sugary milky tea to blast myself into productivity. I started to furiously make lists, Skype with my struggling student research group, catch up with a former student, talk with an administrator about a failing student at school, sort papers and type – seemingly all at once. Slowly, the tears started streaming down my cheeks. “How am I ever going to get all of this done and do a good job and do right by my students?” I wailed to nobody in particular as my dog looked at me sleepily from nest on the floor, one ear drooping sleepily across the room. Hacıyatmaz grins as all of this goes on, wobbling back and forth as he does 365 days per year, reminding me of all the personal writing that is welled up inside me like an impossibly perfect and ready to be sliced watermelon on the hottest of summer days. “You must get it out – you have that new Turkish mother-in-law idea that your e-friend gave you to work on that is already half written in your head, what are you waiting for?” The write-a-matrix just turns to look at me and starts cracking her whip on either side of the massive stack of papers that represent all I am to do today. All the while, I am wailing. And at just the crescendo of this madness in moments marbled together in a pounding heart, I get the email from a journal editor explaining that my review of a manuscript is 2 months overdue – and this one hadn’t even been on my radar! Victoria Falls entered my living room, and all the puppets were washed away. After the falls receded into the memory of my unconscious, I looked around at my somewhat clean slate. Yes, my life is cushy, I am financially stable, I have a dream job, I have health insurance, a partner I love, a family who cares about me and friends galore. I know all of the truths and reframes but in this moment, I am still at my wit’s end. I can understand people’s desires to “tune in and drop out” and today, I am not far from it. Yes, I put too much pressure on myself to do good work, but isn’t that part of what is important? So much to figure out. So much to do. So many limits to set. So, that is the goal for today. Nothing will die inside. The puppets all seemed to agree with this, so for once, there is consensus in the puppet household called my head. Let’s see what happens tomorrow. This entry was posted in A Karagöz puppet battle, Academic hell, Visits from the Karagöz puppets and tagged anxiety, compass, Karagöz, Norman Cousins, Puppet, stress, Turkish tea, Victoria Falls, work-life balance. Bookmark the permalink. In other words just chill!! . . are there such things as ‘e-warm fuzzies’? If there are then there are some heading your way (don’t worry, they’ll wait their proper turn and place). Working on it! Better at the end of the day with some important stuff accomplished…just a never-ending cycle. I think they landed here mid-afternoon, many thanks! Sorry to hear the you’re feeling so overwhelmed, Liz. I think it happens to us all these days, with information and demands coming from so many directions. When I feel this way (which is, sadly, all too often) I find that it helps not to even attempt to multi-task and, instead, to just focus on one task at a time, and to complete that one particular task or project before moving one to the next one. For me, there’s something about being able to check one item off the list that makes the rest of the list seem more manageable. Such are Mondays in my academic life when I have spent the weekend “just” on family time! Thank you, Carol – man – I sent the angst into the universe – and so much support and good advice came back. It’s all one foot in front of the other this week! Much appreciated!